As far as household chores go, nothing is as routine or as intense as cleaning your floors. While most of us have to vacuum carpeting, those with hardwoods may think that they have things a bit easier. While that is true for day to day operations, the fact is that wood requires plenty of upkeep over time. If your hardwood floors are old and looking dingy, then you will want to do a deep clean and seal to get them looking their best. 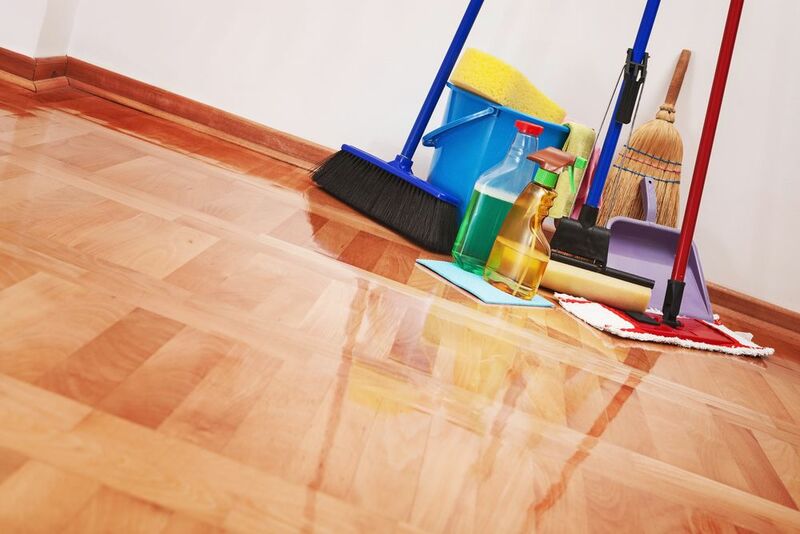 Whether you want them to shine bright like a diamond or you simply want to erase scuff marks and scratches, cleaning and finishing your hardwood floors can be an intense and laborious experience, but well worth it. Today we’ll be showing you the steps to how to clean old hardwood floors that will look brand new again. In some cases, your floor may be damaged enough where you will have to refurbish them, but we are going to focus on general cleaning, rather than going full bore. Thus, if you do need to refurbish, this tutorial will only take you part of the way. Nonetheless, this is an excellent method to follow for keeping your floors up to date and clean for years to come, so if you do have to refurbish, follow these steps afterward, so you won’t have to do it again for a long time. Overall, these are the materials you need. As far as brands of cleaner or sealant, it will depend on the kind of wood you have and what kind of results you want. For example, if you prefer shiny floors then you want a sealant with a high gloss. Similarly, some wood grains look best with various finishes, so you will have to do a little more research to find out which one will be ideal for your situation. As far as optional items here, the steel wool and the terry cloth are not necessary for everyone. The fabric is meant to be used to dry and buff the floor after applying the cleaner and the sealant, but you can do it with other materials as well. Also, the steel wool is there to see if you have wax applied to your floor. If you already know, then you won’t need to use it. Now that we have our materials let’s get cracking on making our floors look their best. One thing that you have to plan on, though, is that this job will take longer than just a couple of hours. Also, for best results you will have to clear the whole room for a couple of days, so don’t try to do this before having people over or anything. Before you begin on anything, you first want to determine if your floor has wax or sealant, and what kind of sealant you want. As we mentioned, there are many varieties from which to choose, so pick one that works best for your floor. Also, it’s important that you figure out if your floor has a modern sealant or not, as that can affect your cleaning process. To test for modern sealants, drop a little water on the surface. If it beads, then it’s modern. If not, then you need to add one to prevent water damage in the future. Make sure that your whole room is clear of anything that can get in the way of your cleaning process. Since you have to apply sealant in one sitting, you can’t clean part of the floor and then move to the other side when finished. This will result in an uneven finish and could make your floor look wonky. You want to get into every nook and cranny so that you don’t have dirt and debris getting into your mop or your sealant. Using your mop bucket, dilute your cleaner and then start mopping the floor. If you don’t have a modern sealant on it already, then you want to use just water and apply cleaner to any particular parts that are extra dirty or scuffed. This will prevent damage to your floor. Once you’ve cleaned it all, then you have to make sure that it’s as dry as possible. The best way to do this is to wring out the mop thoroughly and then use it for soaking up excess water. You can also use a terry cloth to ensure that you get better results. If you leave the water on the surface, it could lead to damage and warping. It’s important that you remove all of the cleaning solution from the surface of the wood, so use a damp towel to wipe it off. You will also have to dry the whole thing again afterward. After your floor is completely dry, then you can start to apply your sealant. To ensure that you get an even layer, you want to use a Swiffer mop (flat head) or a roller. Using a standard mop won’t get the same results, so don’t try to use that. When applying sealant, it’s imperative that you keep the edges wet so that it doesn’t dry before you move to the next section. To get the best results, start in one corner and then slowly work your way to the other side, reapplying sealant on the edge closest to you while you move backward. Once the sealant is on every inch of your floor, you have to let it dry for several hours, or up to a day. This will vary depending on your particular product. Check the sealant to see if you have to wait a certain amount of time before putting the furniture back on the old hardwood floor. In some cases, they may recommend waiting up to two weeks to ensure that you don’t scuff or scrape the new finish. Once you’re all done with cleaning, your floors should look fabulous. While we do recommend that you do as many of your rooms as possible at once, we understand that you may have to go room by room due to space constraints with all of your furniture and stuff. Anyway, thanks for checking us out and we hope that you enjoyed this tutorial. With these steps, your old hardwood floors should look brand new for a long time afterward. For Steam Vacuum for old hardwood floors see these reviews.